Amanyara is all about stepping out of the rush of every day and letting nature take over. This villa’s pavilion arrangement and infinity pool makes time spent outside effortless, and staying indoors is just as rejuvenating. You’ll want for nothing between the amenities and inclusions, like a full-time chef and attendant, personal golf carts for easy water access, on-demand spa treatment, and tons of land and water activities. At Amanyara, everything and everyone is taken care of. Resort amenities, luxury accommodations, oceanfront! 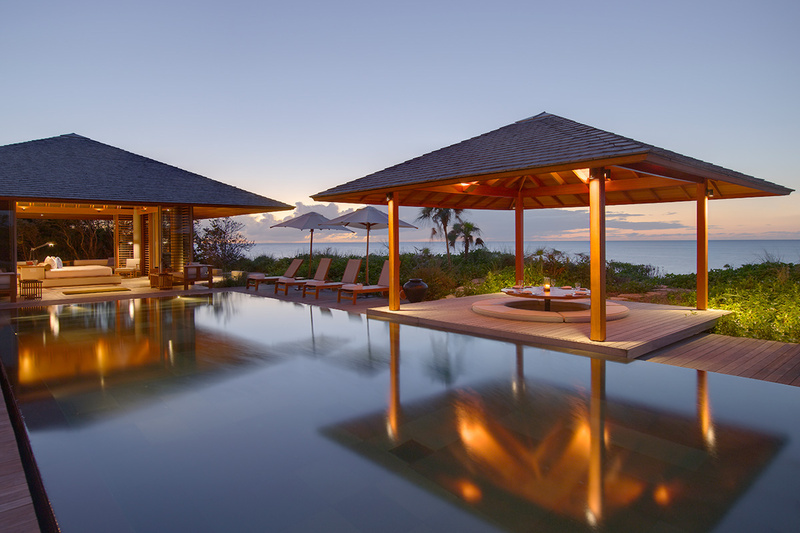 Amanyara Resort is surrounded by a lush nature reserve on the northwestern coast of Providenciales. Stretching for half a mile, its powdery, white-sand beach and crystalline waters frame modern structures. Amanyara’s Oceanfront Villa has embraced its secluded beachside setting with a contemporary design that includes soaring ceilings, dramatic rooflines, and open-air structures. Using timber and glass, the villa is imbued with tropical elegance. The villa has stunning ocean views and plenty of outdoor space to enjoy them from. On the sundeck, there’s a massive infinity pool long enough to swim laps, several loungers to sunbathe in, and a sunken dining gazebo. A shaded veranda with lounging furniture faces the pool and sea, and the open-air living area sits at the head of the pool. The oceanfront villa sits on a coral bluff with ocean views, and there’s an outdoor shower for guests to rinse off any sand from a trip to the beach. There are two four-seated golf buggies so guests can easily access the resort’s different areas, and a full-time chef and housekeeper cater to every need. The villa also has a private walkway that leads to the sea. The interior has extensive living and dining areas, a modern kitchen, and four bedrooms. Vaulted ceilings and minimalist Asian design decorates the interior, with sleek furnishings and bamboo accents. The kitchen is full service, equipped with restaurant-grade appliances and plenty of counter space. There’s also a mini-bar that guests have access to, excluding spirits. All four bedrooms have king beds, TVs, and outdoor showers. The bedrooms are decorated mainly with warm bamboo and wood, for a naturally soothing ambience. To top it off, the bedrooms are air-conditioned and open to the wraparound terrace. Amanyara guests have complimentary access to non-motorized water sports, daily snorkel trips, the tennis courts, fitness equipment, regular yoga classes, a private bar, afternoon tea, and in-room wireless internet access. Two 4-seater golf carts an access to resort amenities.